Shorecliffs Golf Course Hole 1: This is the only par five on the front and it is not really a good scoring opportunity either. The drive is fairly wide, but there is hillside right and creek left. On the second, the hole doglegs left and the fairway gets very tight, and slopes right to left. The green is protected by a bunker right and is very small. Shorecliffs Golf Course Hole 5: This is the first of two short par fours, and this one has an ocean view from the elevated tee box. The fairway is really tiny and there is trouble left and right. The big drive can fly the short palm tree to the right of the fairway to get close to the green off the tee, but accuracy is a must as a hazard stroke is only a few short yards away. The green, once again, is really tiny. Shorecliffs Golf Course Hole 6: The next short par four is incredibly tight with a concrete v-ditch heading down the right the whole way and hillside penalty strokes beyond that on both sides. The green is tucked right behind the hill and, although the player can get real close to the green off the tee, once again, there is very little room for error. The large bunker short-left makes hitting this very tiny green even more difficult. Shorecliffs Golf Club Hole 9: This is the longest par four on the golf course, and it is an uphill dogleg right with the creek running down the left and OB to the right. 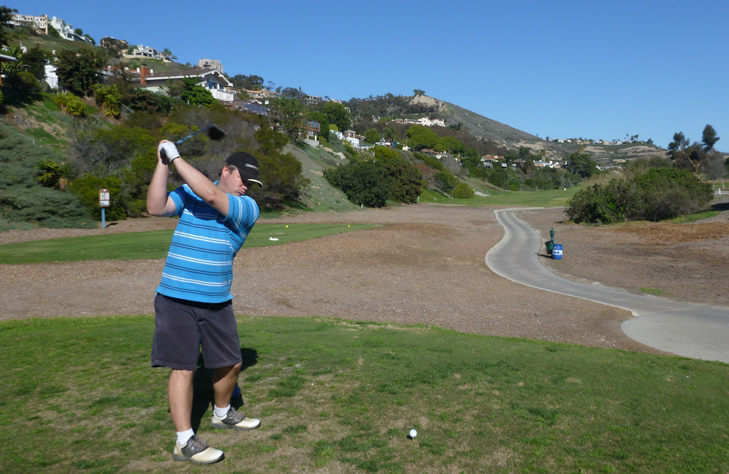 Shorecliffs Golf Club Hole 11: The best hole on the back nine is also the longest and most difficult. Uphill all the way, there is OB left and hazard right. The second and third shots are also tight with sand traps waiting to gobble up errant shots. The elevated green is narrow, but deep, with a strong break from back to front.